Thanks to comicbook.com/gaming for the lovely, appropriate image. 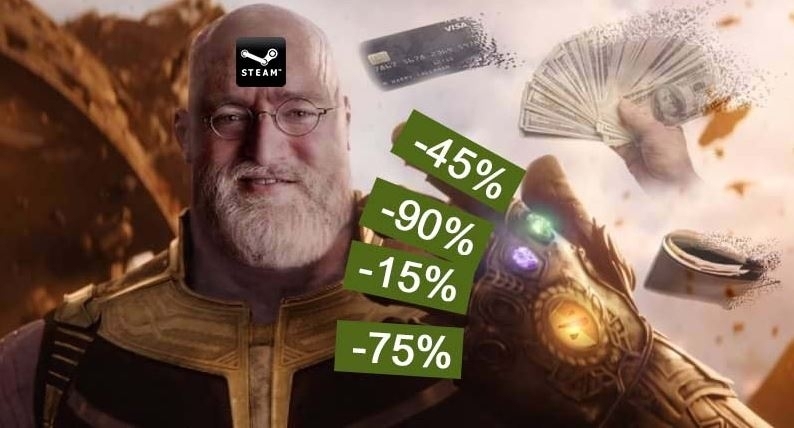 The Annual Steam Sales are when gamers around the world dump their wallets into Gabe Newell’s Scrooge McDuckian vault, where I assume he cackles maniacally and dives in, using the secret “Gold Swimming” technique. I don’t really spend on it like I used to, because I have most of the games I want. But that doesn’t help you guys at all! So, with a very special thanks to Epip, a little research has been done! Across a few Discord servers, a question was offered up, as to what the “Best Games Under 10 bucks are or are on sale for more than 50% off” were. The Bottom Tier Discord was included in this, and from those discussions, a nice list of about 20 games were put together. So I’m going to narrow this down with my “very Scientific method of whatever the Hell I feel like” and offer some suggestions to you guys! The sale is still going on, so it’s likely not too late. If one of these (or more) have ended, then my sincerest apologies. I don’t think that will happen though. These games are in no particular order, but the ones I find most interesting will be bolded. So please allow me to kibitz about some sales! 1. Fallout New Vegas Ultimate ($9.99) (Reg. $19.99, 50%) – Come on, it’s arguably one of the best action RPGs made. The Mojave Wasteland is the setting of this Fallout title, where you’re out to find the person who killed you. Well, they tried anyway. The western setting is very compelling, and the Ultimate edition comes with all of the DLC that was developed for the game, which is wonderful. It also has way more guns than Fallout 3 had, and isn’t that what’s really important? With Fallout 76 coming later this year, it is a great time to give this important title in the Fallout franchise a spin, if you have not already. If you just want the base game and none of the DLC, you can pick that up for $3.29 (Reg. $9.99, 67%). There are lots of different ways to approach it, and none of them is the wrong way. 2. Hollow Knight ($9.89) (Reg. $14.99, 34%) – This is not the last Metroidvania to be on this list, but Hollow Knight is also a topical pick, as it recently came to the Nintendo Switch. Hollow Knight has grim but adorable art, and incredibly sharp, responsive controls. Team Cherry really outdid themselves with this one, and any platformer with free DLC is okay in my book. It is a gorgeous, loving tribute to the challenge and feel of the 2D platformers of old on the SNES. From the incredible music of Christopher Larkin to the absolutely stunning hand-drawn art, this game has it all. Metroidvanias are my favorite platformers too. I love searching, exploring, finding new powerups and putting them to use in crazy ways, and this definitely has that on tap. Other Suggested Pick: Ori and the Blind Forest Definitive Edition is in this same category, is just as gorgeous and technically sound and has another title in this series coming ($9.99) ($19.99, 50%). 3. Darkest Dungeon ($7.49) ($24.99, 70%) – Confession Time – this is one of the only games on this list that I do not have in my personal Steam collection. But everyone I know seems to have it and streams it, so I have a lot of experience with Darkest Dungeon. Darkest Dungeon is a gothic roguelike that is also a turn-based RPG, and those are two great tastes that go great together. What makes this fascinating is that it’s also a psychological thriller-style game. You have to deal with the psychological stresses of adventuring, where monsters and stress both are something you combat. I’ve talked to people who found this game helpful to their own mental struggles, to know that they aren’t the only one dealing with those tribulations, and that’s interesting in and of itself. The art is in a gorgeous crowquill style, currently has 16 character classes, and there’s a wealth of challenge to the game. There’s also the “Ancestral Edition” on sale ($22.34) (Reg. $53.95, 59%), that comes with all the DLC, and the Soundtrack, which is also very much worth a buy. Other Suggested Pick: Rogue Legacy however, I have personal experience playing, which we played on Bottom Tier (found here), and is a terrific rogutelite where every time you die, you play as an ancestor of the last characters, each with their own “quirk”, whether it be good or bad ($2.99) (Reg. $14.99, 80%). 4. Borderlands 1 & 2 (1: $4.99 (Reg. $19.99, 75%)) (2: $4.99 (Reg. $19.99, 75%)) – This shouldn’t be one I have to explain too much. No matter what you think of Gearbox, the Borderlands games are absolute treasures in the online multiplayer shooter/RPG genre. With outrageous, insane characters, wild, ridiculous guns, incredible amounts of content, and a nice simple story, these are an absolute hoot to play. I’ve yet to encounter a world so bonkers as I have with Borderlands that I enjoyed this much. I should really go back and play these, now that I’m thinking about it. Whether you play single player or in online four-player co-op, these games give you what you want: Violence, Explosions, Cool Guns, Explosions, Witty Dialogue, and Explosions. 5. Terraria ($4.99) (Reg. $9.99, 50%) – Terraria’s not really my cup of tea. It’s another case of “this is really amazing for the people into this style of game”, and the Overwhelmingly Positive reviews on Steam are a testament to it. Terraria is a side-scrolling sandbox building/survival title where you explore, dig, fight, and do whatever you feel like doing! You can construct massive structures, a village, city, just go exploring through randomly generated worlds, and also does plenty of free updates (aren’t those just the best?) Another great part of this sale is that you can buy the Terraria 4-Pack for 50% off right now too ($14.99 – Reg. $29.99), so if you have friends that are interested in playing this online with you, you now have a team of adventurers! Who can’t beat that? Damn, 60 of my friends on Steam have this. I know couples that play it together, friends that regularly hop online and stream their adventures, there’s just so much to do in it. 6. Dead Cells ($11.99) (Reg. $19.99, 40%) – If you thought somehow I was done talking about how amazing Dead Cells is, you’d be. . . dead wrong. It doesn’t exactly fit the qualifications of this piece, but it’s 100% worth getting anyway. It’s a platforming roguelite Metroidvania, and it’s still in Early Access. It’s gorgeous, insanely challenging, and every playthrough you get just a little bit better. A little bit stronger. So instead of prattling on about this game (again), here’s a review of it, and a recent stream of it. 7. Undertale ($4.99) (Reg. $9.99, 50%) – Undertale is a game that I have not completed, like many on my list, but this one’s special. Undertale creates a unique opportunity in that you can (and probably should) complete the game without defeating any enemies. It keeps track of what you do/do not kill, and effortlessly combines rhythm-based “combat” with a turn-based RPG. It’s an unforgettable story, teaches valuable life lessons, and has scenes that are sincerely touching/anger inducing, depending on how you feel about the characters. For a game that initially started as an EarthBound hack, it really has created something special. It’s a must-experience RPG, and getting at least two or three runs out of it is not uncommon. For five bucks, you can’t miss Undertale. 8. Furi ($7.99) (Reg. $19.99, 60%) – This is another game I’ve reviewed here on OnRPG! This is a game that I’m absolutely awful at, but love everything from the aesthetic to the actual difficulty of the game. You can find that review at this handy link, but the essence of Furi is that it’s a Bullet Hell conveniently disguised in a Boss Rush. It’s an arcade-style dueling game, where you head from one insanely difficult boss to the next with an amazing visual style and very catchy, addictive music. The key to the game is simple: Kill the Jailer, and then you’re free. You’re in a jail because you committed “crimes” that are apparently so unspeakable, they’re not immediately clear. It’s probably something spooky like “free thought”. It’s a real testament to what can be done in Unity, and I never felt like I was losing because I was bad, but because I didn’t learn the mechanics. Plus the characters were designed by Takashi Okazaki (Afro Samurai), and who doesn’t love that? 9. Stardew Valley ($11.99) (Reg. $14.99, 20%) – This one to me is another kind of no-brainer pick. And I understand, it technically doesn’t make the list (again), but this is my list! And Stardew Valley is an incredible game. Do you remember those wonderful farming games like Harvest Moon, where you find yourself doing something you hate (yard work/working outdoors) but somehow wind up loving anyway? That’s what Stardew Valley is. You inherited your grandfather’s farm, and it’s time to settle down, start a new life, and make something of it/yourself! You’ll make friends, probably find love, and create a profitable, lively farm! Plus there is now the Multiplayer Opt-In Beta so you can play with a friend and work together! It’s soothing, adorable, and it is easily one of the most heartwarming experiences I’ve had playing video games.